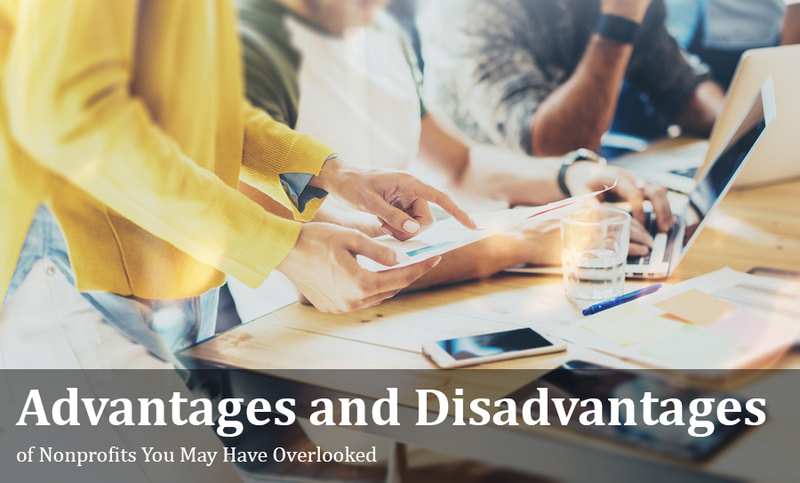 Many jump into a nonprofit career after glossing over the basic advantages and disadvantages of nonprofits without understanding what it actually takes to thrive in the nonprofit world. Unfortunately it’s those same people who burn out quickly. Not to be discouraged, a good understanding of what’s to come will allow you to manage your expectations and plan for a successful, impactful career in the nonprofit world. In simple terms, a nonprofit organization takes any profits it receives from goods, services, donations, or sponsorships, and cycles them back into the organization to further achieve its mission. Nonprofits commonly serve communities (clubs, churches, associations, chambers of commerce, etc. ), or are organized around social causes (humanitarian aid, disease research, education funding, etc.). In contrast, for-profit businesses distribute profits to their shareholders and investors. If you're thinking of starting a nonprofit, here is a full guide on The 6 Steps to Start a Nonprofit the Right Way and Get Your First Paying Members. Eternal Life: Nonprofit organizations (just as for-profit organizations) can exist long after their founders leave as long, as their purpose stays relevant and they continue to generate revenue. The oldest company in the world, the Kongō Gumi construction company in Japan has been around for nearly 1,500 years. Organization at Scale: If you are a mission-driven individual who wants to make the world a better place, organizing a nonprofit around your chosen cause is the best way to build a team to expand your efforts and make a bigger impact. Protection from Personal Liability: Employees of nonprofits are not personally liable for the debts of the nonprofit. This means that if someone wants to sue your nonprofit for a business-related debt, or injury, they can only go after the corporate entity, not the personal assets of its owners. Tax-Exempt Status on Net Income: Nonprofits do not pay taxes, so all earnings can be cycled back into the organization to improve it. Public and Private Incentive to Help You Out: Donations made by individuals and corporations are tax-deductible, thereby incentivizing people to contribute to nonprofits. All you have to do is create a clear mission and a strategy to collect donations. I will cover both of these areas in this article. Grants Eligibility: An additional source of funding for nonprofits is through government grants. Employee Benefits: If your nonprofit has enough employees, it may qualify for group discounts to health or life insurance benefit programs. Formalized Structure: Incorporating a nonprofit can allow you to create formalized roles with job descriptions and responsibilities, which can attract more professional and skillful candidates to work with you. Volunteer Board Members: Typically, nonprofits do not pay their board members, which can save a lot of money. Another pro about board members is that they bring a variety of valuable skills, expertise, and greatly expand your network. Highly Motivated Employees: Research shows nonprofit employees are highly motivated by intrinsic rewards like achievements of their clients and a good work/life balance, rather than pay. This means you can expect to attract employees who care about your nonprofit’s purpose and want to help you make a difference in the world. Time and Money to Start: If you’re thinking of starting a nonprofit, it is likely to take months of preparation and devoted work. It can also cost up to $800 just to submit your application to the IRS. Depending on your bandwidth and knowledge, you may need to hire a consultant to make sure you’re filing everything correctly. Continued Maintenance: All nonprofits are required to submit annual filings and comply with all laws of incorporation. There are also quite a few activities which may jeopardize a nonprofit’s status (like lobbying). Note that legal requirements differ from country to country. See here for Canadian requirements. Prohibition from Political Campaigning or Lobbying: nonprofits which engage in attempts to influence legislation risk their tax-exempt status. Founder Micromanagement: "One thing I see is the separation that often needs to occur between the founder/visionary and the longevity of the nonprofit. Too many times they feel the need to control the 'baby' they have created and have a tough time reporting to a board," says Nick Walters, Grant Writer and Speaker. When he first visits with founders he asks, "If you got hit by a truck and were in a coma for six months, would the nonprofit run without you?" Unfortunately the answer is often "no". Public Scrutiny: Anyone may request copies of any nonprofit’s filings and review their expenditures, salaries, and income. If your nonprofit will have a large public facing, you can expect some scrutiny over how you handle administrative expenses. There are always articles about overpaid nonprofit CEOs and employees being published. No Profits: No individuals or shareholders can receive profits from your nonprofit. This can make it more difficult to generate interest from potential investors. This does not mean you will not be paid a salary, it just means that excess funds at the end of the year must be cycled back into the nonprofit. Volunteers and Volunteer Board Members: Volunteers are a pro and a con. From a con perspective, sometimes it may be had to find willing volunteers to help you achieve your mission and even when you do, they can be difficult to manage. On top of this, a volunteer can leave at any time without recrepussion, so you must always have a plan to replace them without notice. Funding Difficulty: While listed as a pro before, getting funding for your nonprofit can be a constant struggle. Given that there are over 1,500,000 nonprofits in the US alone, there is high competition to receive funding from donors, funds, and grants. Many nonprofits hire professional grantwriters to give themselves a better chance. The "Nonprofit Employees Should Get Paid Less" Trap: Many people justify paying nonprofit employees less, because they "should be dedicated to the cause rather than the salary". Unfortunately this trap creates frustrated employees and talent that waves goodbye. The perpetual turnover makes it harder for the nonprofit to achieve its mission, and may even cause it to close its doors. This is a very common issue and I encourage you to read a great blog post from the NonprofitAF blog in learning how to deal with it. Lastly, a Word of Caution: With over 1.5 million nonprofits in the US, most are small in size with only a handful of employees expected to wear all the hats. I’ve come across many nonprofit employees reporting a lack of career progression, benefits coverage, and professional skills development. On top of this, office politics (as can arise in any organization) can override a nonprofit’s mission, stalling operations and frustrating employees. This isn’t to say all nonprofits are like this, but awareness of these situations and knowledge of how to work through them can help you address them if they arise. If the advantages and disadvantages of nonprofits line up with your personal values and goals, then you’re almost ready to take the first step to jump into a nonprofit role. But before you do, consider these five pieces of advice from seasoned nonprofit professionals. 1) Beware of organization executives or directors who have their own personal agendas and ambitions, which are often at odds with the mission. Nonprofits are not immune from subterfuge, insurgencies, ruthless competition, corporate retaliation, personnel issues, or even the vagaries and whims of fickle funders and foundations. 3) Entering a not for profit it not a "job", rather it is a way of life and the sooner more individuals understand that the easier that "way of life will or can be. 4) Just because you have a great cause, does not mean people will give. Raising money to keep your organization alive is the hardest job ever! If you’re looking for even more advice from seasoned nonprofit professionals, check out these 24 Things I Wish I Knew Before Entering the Nonprofit World. If you want to build a successful career, the most important thing you can do is to stay on top of your professional skills training. Unfortunately the many hats you’ll have to wear at your organization (admin work, fundraising, donor management, event planning, etc.) can severely limit the amount of time you’ll be able to spend on skills training. This is a trap that can keep you in the same position for years. One easy way to develop your skills on your own time is to take online training courses — every month a number of organizations offer free, professional training for nonprofits in the form of online webinars (which you can watch at your own convenience). I’ve listed where to find the best ones in the section below. If you’re looking to improve your professional nonprofit skillset, and you’ve got an hour to spare, watching a webinar can kill those two birds with one stone. I’ve created a list of the top 24 free webinars for nonprofits to advance their skills training and professional development. The list includes webinars in a variety of areas such as nonprofit marketing, finance, fundraising, events, social media strategies, and more — all run by experts in their fields. If you watch every one of these webinars, you'll be sure to have an excellent breadth of knowledge in nonprofit management.